You'll be £30.00 closer to your next £10.00 credit when you purchase Midway: Dauntless Victory. What's this? This is an in-depth study of the Battle of Midway that reviews the many previous accounts and compares their accuracy and veracity with fresh documentation that has been released recently, including some new material on the post-war analysis made by a select committee. There are new viewpoints on the muddle among the US Admirals; the total failure of the USAAF, despite elaborate claims; views on a whitewash of Admiral Fletcher and others; fresh thinking on the part played by the US Navy Dauntless dive-bombers in the action; the mystery of the carrier Saratoga's presence; Hollywood's totally wrong take on the battle in all the films since made about it; some new eyewitness material the author has obtained and information from Japanese sources not previously used. The Appendices will include statistical details - the ships, the planes and the men. Peter C. Smith, a renowned British historian, provides the reader with an academic review of the American victory that marked the changing of the tide in the Pacific War. As a reader with little more than casual knowledge of the Battle of Midway, I found the book to offer a balanced look of the battle from both sides of the conflict. Immediately following World War II, the Air Force was fighting to establish itself as an independent military service, and the Navy was looking to continue its revolution into using the carrier as the centerpiece of a naval battle group. Therefore, any "official" document put out by either of these organizations immediately after the war needs to be considered with these historical contexts in place. Smith uses both Japanese and American sources to publish the decisions and sequence of events that may have been exaggerated or neglected by the official battle reports published by both of these military services. Not only did Smith focus on the order of battle, but he also did an outstanding job of highlighting the many facets of this battle's impact. He reviews both Nimitz's after action report on the battle, and it's long term implication for the US Navy. Smith also describes the variables in the calculus equation that defines the international relations of the Pacific powers. Smith's second appendix, "Midway and the Media" offers a very candid assessment of the impact of the media on the public's view of the Battle of Midway. I have to admit that my knowledge of the battle was impressed at an early age by Henry Fonda's portrayal of Nimitz in the 1976 movie "Midway." Smith calls for a historically accurate documentary that not only correctly portrays the order of battle, but also includes historically accurate movie clips. 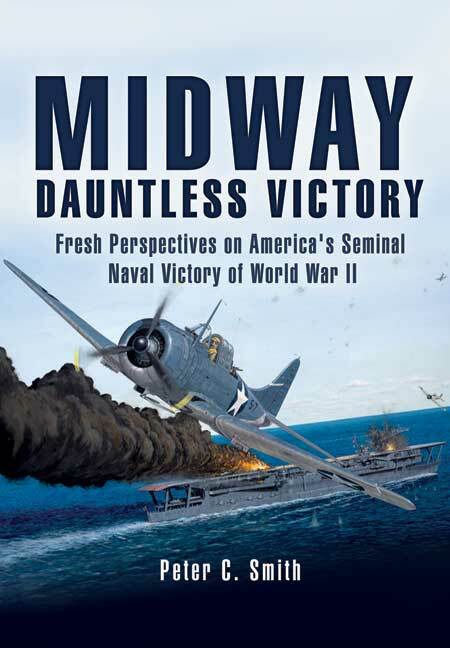 Overall, "Midway: Dauntless Victory" is a superbly researched book. It is historically accurate and expertly supported by photographs. The few nautical charts were dispersed throughout the book, and I thought were illogically placed about page 194 instead of in the beginning part of the book where the description of the battle took place. The book is written in plain enough language for the casual reader, but the feel of the book is more of an academic debate. There is no better book than "Midway: Dauntless Victory" to set the record straight. Smith writes in his conclusion "Then what, in history, was Midway? It was the turning point, the line in the sand when the Japanese overreached themselves and the Americans stood and fought them to a standstill... The Tsunami had met the cliff and, surge though it might, could advance no more." Smith's book has set a high bar for other naval historians to measure up to. J. Rudy "Major, USAF", Fairfax, VA. Impressive and exhaustively-researched. Remarkably thorough, even-handed and fair. A superb, well-written historical analysis by a remarkably well-qualified and air author. The amount of research and substantiation is amazing. An illuminating volume, a quite exceptional work. This book comes highly recommended. Recommended for readers who want to study not just the Battle of Midway itself, but the command and control of forces at the dawning of the age of three-dimensional warfare. An immense body of work that, on balance, may be the most comprehensive Battle of Midway history ever produced. It excels in the depth of its analysis of virtually every facet of the battle.